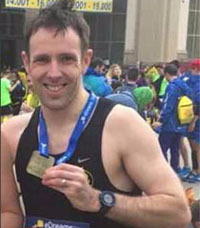 To begin with we would like to send the very best of wishes and good luck to Eddie Trindle and Ken Nyhan who are running in the Reykjavik Marathon this weekend, On Saturday 19th August. Two of our many superstars in the club; have a great Marathon guys ! Another successful tempo run tonight with thanks to John Desmond for leading this. The main event this weekend is ‘The Coffee Run’ on Sunday 20th August. 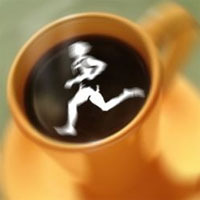 The coffee run is again open to members and non-members so feel free to bring a friend, family member, date …. If you can help Tracy out and offer to lead a pace time then please do get in touch. The next Coffee Run is planned to take place on Sunday 20th August at 8:30am. This time we’ll be going back to the original route of Raffeen, starting from Bean Leaf in Mahon Retail Park. Again, we’re going to open this to non-members so it would be nice to have a few pace options available if any non-members do attend. 1) 8:30 am – Raffeen route. As always thank you to everyone who contributes to the weekly email, and if you have anything that you would like to add please do let us know, we are always happy to hear from you! 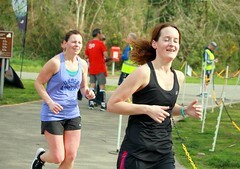 There was one Eagle participant in this 5k race in Shanagarry last Thursday. Well done to John finishing in 18th place overall. 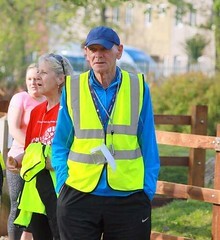 Congratulations to Denis 2nd M55 over the line in this 8k race in Mitchelstown on Friday. This 5 mile race had about 100 participants. It started in Goleen and finished in Crookhaven. There was 1 Eagle member taking part. Congratulations to Pat finishing in 7th place overall and 2nd M45 home. 535 runners took part in this 5k at the Marina last night. Eagles spotted in the category prizes are listed below. As usual, clubs are not listed in the results so if you would like your time or another member’s time listed for these BHAA races please email the results on and we would be more than happy to include them! Two Eagles on the podium last Saturday in Castlehaven. Well done Ciaran and Pat! 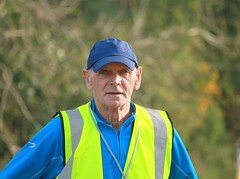 Many congratulations to Club member Frank Cotter who completed the Ironman in Hamburg last Sunday. This consisted of a 3.8K swim 180K cycle and full 42K marathon, in a time of 14 hrs and 20 minutes. Thanks very for letting us know, on Franks behalf, such a great achievement! 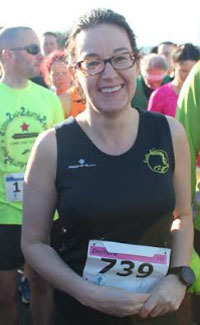 Well done to Alan, Viv Frank, our representatives at the Rock Roll Half Marathon last Sunday. With 10838 runners taking part, the lads finishing positions were fantastic, along with their times. 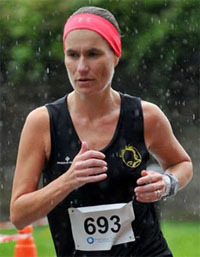 The East Cork Harbour Marathon took place on Saturday morning, August 12th. 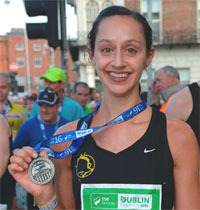 There were Full, Half and 10K races on offer. In the half we had 6 members taking part and a further 7 on pacing teams, and in the full by Grellan, also on pacing duty. 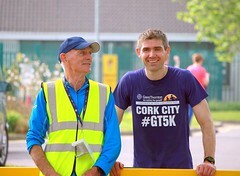 Well done to club member Conn Donovan who is one of the race organisers, it was a very well run event. Congratulations to Tom Fox who took 1st M50 in an impressive 1:27:40 on a very hilly course and welcome to new member Raphael Cabral from Brazil who ran 1:34:52. Defibrillator at the CIT track: Please note that a new defibrillator has been installed at the CIT track. Denis and myself have put together a document with details about it. (Link sent to members). If you are trained in the use of a defibrillator, please take the time to read it and note the access code. 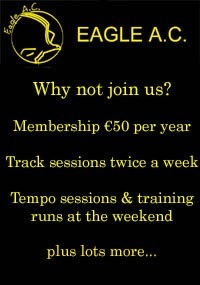 Club Membership : Colin O’Herlihy has been busy registering new members with Athletics Ireland and our current total stands at 183. This is in line with this time last year and we’ll probably end the year around the 200 mark. Club Talks Workshops : The club is currently looking at organising some talks and workshops over the next few months. Details to be confirmed. The Coffee run is coming up again on the 20th and Tracy has sent an email on this but just a reminder ; the coffee run is again open to members and non-members so feel free to bring a friend. 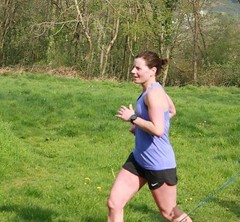 If you can help Tracy out and offer to lead a pace time then please do get in touch. 2) 5/6 miles – Flat, heading for Passage and back. 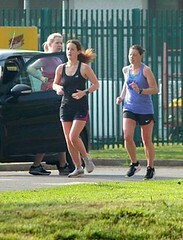 246 runners took part in this 5k in Conna on Friday evening. Damian and Denis were the 2 Eagle participants. 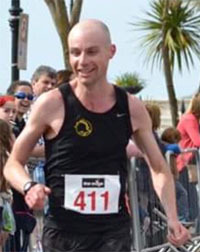 Well done to Men’s Team Captain Damian on his top 10 finish – made more impressive by the fact that this was his first race back since a recent layout with injury. No stopping him now! 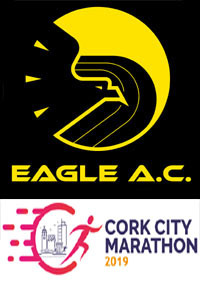 Eagle AC was well represented at this 5 miler which also took place on Friday evening. 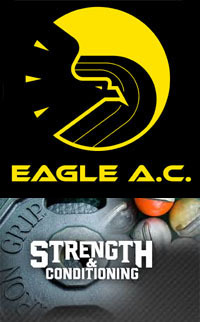 There were 14 Eagle participants overall , with a number of members in the category prizes. Details are listed below. 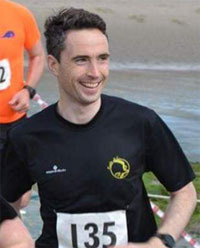 Well done to all who took part in the BHAA 5 mile in Halubowline on Wednesday evening. As usual with no clubs listed the following are club members spotted in the prize positions. 8 John DUNPHY 20:06 VM45-49 72.22 % M 7 Eagle A.C.
17 Conor O’BRIEN 21:04 VM40-44 64.79 % M 16 Eagle A.C.
22 Andrew KELLY 21:29 VM35-39 61.37 % M 21 Eagle A.C.
32 Pat TWOMEY 22:19 VM65-69 75.88 % M 28 Eagle A.C.
49 John SWANTON 23:14 VM35-39 56.74 % M 42 Eagle A.C. New PB! 63 Dolores GIBBONS 24:16 VW40-44 64.84 % F 8 Eagle A.C.
10 Michael DOOLEY 26:20 VM50-54 56.46 % M 83 Eagle A.C.
110 Noella CARROLL 26:42 VW40-44 58.93 % F 20 Eagle A.C.
126 Flor TWOHIG 27:46 VM50-54 54.44 % M 98 Eagle A.C.
156 Monica TWOHIG 29:47 VW50-54 58.48 % F 41 Eagle A.C.
165 Gary GIBBONS 30:01 VM45-49 47.25 % M 122 Eagle A.C.
29 Richard PIOTROWSKI 25:35 VM70-74 68.93 % M 26 Eagle A.C.
8 Niall MCSWEENEY 21:59 SM30-34 59.36 % M 7 Eagle A.C.
29 Hugh MCSWEENEY 26:01 VM70-74 68.61 % M 25 Eagle A.C.